Convenience is always in fashion! 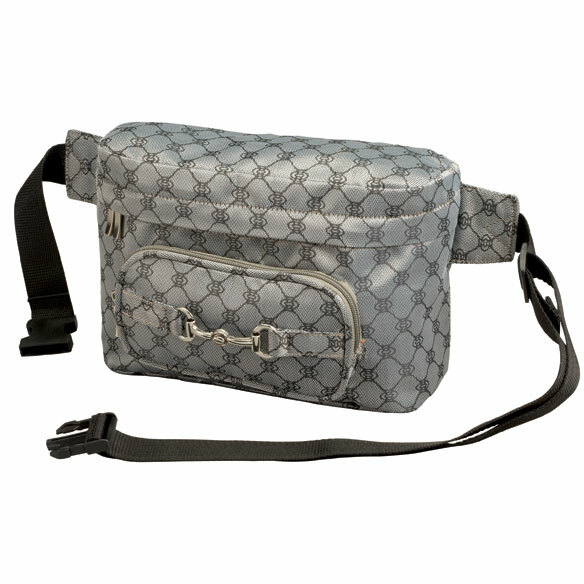 Stylish jacquard exterior features easy-access front and secure back zip pockets. Spacious interior features large zip pocket, small pocket and 4 card slots. Waist strap with quick-release buckle expands to 55"L. 10"L x 4"W x 6 1/2"H. Professional clean. I like the option of colors rather than just plane black. As an elder lady it keeps my hands free in case balance is an issue. Feels safe when I am walking, carries my phone in case of an emergency and I feel safer with it. I never use a purse whether I am going to church or for a ride on my Harley. 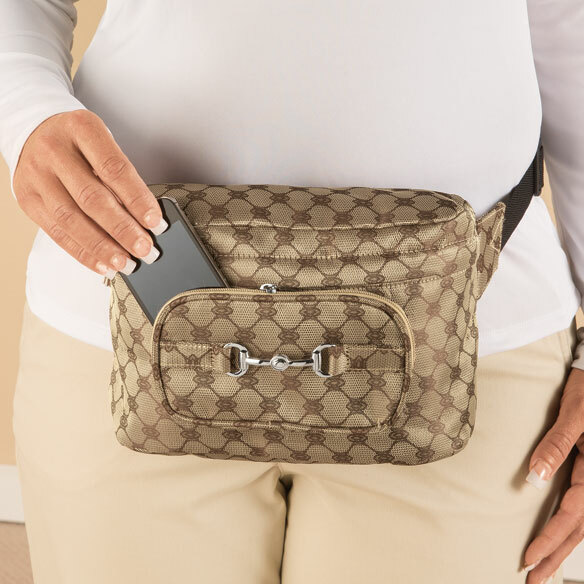 I have been looking for a replacement for my bulkier leather waist pack that my cell phone would fit in also. This pack has a handy velcro strip in the zipper compartment on the back side making it perfect to put keys in & secure even if I don't get it zipped all the way. Plenty of room in main zipper area without being bulky to carry wallet, cell phone, kleenex, pen, paper, etc. Smaller zipper compartment on the front roomy for many options. The color & pattern has a simple elegance about it that makes me feel it looks right for any uses I may have. I definitely do not have a skirt & heels type of wardrobe. I was glad to finally find a fanny pak in another color than plain black. I use these when shopping as it is safer when out and about to have this strapped to the waist rather than to carry a purse in hand, easily to be snatched. I know that if anyone wanted it bad enough they could get it, but this makes is just a little more safe. I hope hat some other colors will become available in the future. I take the city bus a lot and wanted something that didn't have to hang off my shoulder while walking. This was perfect! It held my ID, credit cards, money, pin and small pad of paper, a plastic water bottle and a compact umbrella as well as a bus book! 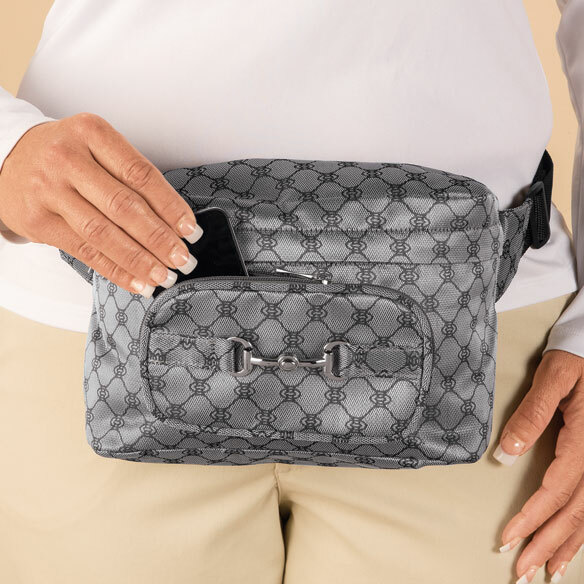 I like that the buckle is more on the side than in the pack for security reasons and you can easily close the belt and wear it on your shoulder as well! I'm at the age that I forget just about anything, this way there's nothing to worry about lo leave your purse/bag behind. I use it daily usually while shopping. The best fanny pack I have brought. Large enough to carry a paperback book. Plenty of room. Light weight, Had those heavy ones. Bought 2 of each color. It frays a little bit on edges but not enough to worry about. Great little bag to carry cell phone, money, small snacks, medications, pen and paper . I like this fanny pack because it has a lot of room to put things. It looks nice, I have gotten compliments. It's a good size, not too big and not too small and looks good. I really like the fashion pack. I did not want leather. However, there is an unpleasant smell that clings to you hands. I am hoping once it airs out the smell will go away. I plan to keep it because I do not want to carry a purse on occasion. I like my fashion pack, but I wish it had a place for my phone. It was hard to zip the middle section closed and the back pocket was hard to access. I recently bought 1 in each color. I like the bags, but I'm confused as to why there is Velcro inside the pocket? I can't use the pocket because the Velcro gets in the way. Are all the bags like this? it was the nicest belt bag I found. I use a walker and I thought this would help with necessities. Have pinch nerve in my neck and a shoulder that needs surgery. Hoping this will take the pressure off. Vacation use for security to have valuables with me w/o trying to hold onto a purse. Is this leather on the exterior? BEST ANSWER: Thank you for your question. It is made from Synthetic/man-made cotton/satin blend. We hope this information will be of help to you.